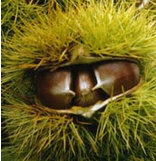 Chestnuts are a perishable product, and fresh nuts must be kept refrigerated until use. They will keep for a number of weeks in your home refrigerator. For most cooking, fresh chestnuts must be peeled before use. Obtain a purpose-built chestnut peeler, or use a good-quality potato peeler. Ensure that both the outer skin and the inner skin (pellicle) are removed. Obviously products such as crumbed chestnuts and chestnut paste may be used directly. Chestnuts can be used to add flavour to many dishes. They make a great substitute for sweet potato (New Zealand kumara etc). How to roast chestnuts? See how to do it. Do not peel the chestnuts, before use. Chestnuts may be left whole, or cut in half. Place the chestnuts on a hot BBQ plate. A favourite for us is to add flavour by melting butter with the nuts and adding salt and often garlic, chilli or ginger. When the chestnuts are ready, the shell will pop open the flesh can be easily removed, and eaten. Chestnuts can be either boiled or steamed (microwave or stove top). Forget to slit the chestnut before putting in in the microwave, otherwise will may explode!! After cooking, they can be used on their own as a vegetable, added to mashed potato or kumara, added to rice dishes and added to stews. More recipes soon…… See also the New Zealand Chestnut Council's recipes.